MAUBAN, QUEZON - Amid the existence of a giant coal- fired power plant for almost two decades, residents of this progressive coastal town can now be assured of a safer environment with the establishment of $180 Million carbon dioxide membrane capturing technology facility at Bgy. Cagsiay 1. During the ground breaking and dedication ceremony for the proposed project, Mauban Mayor Fernando Llamas Lauded Ky Young Shin, Chief Executive Officer of Astroma Company Ltd, a South Korean- based company with self- developed core membrane technology and exclusive device technology for CO2 capture, for the latter’s willingness to establish the facility. Once established, Llamas said the facility will capture the carbon dioxide emission of the existing 450 Mega Watt Quezon Power Ltd, that delivers power to the Luzon grid since year 2000. “Maintaining a healthy environment means increasing the quality of life, and years of healthy life”, said Llamas in his speech during the program. Llamas who also chairs the Mauban Economic Development Board (MEDB) said the people of Mauban are very privilege to have environment conscious partners who are willing to go extra mile not just to ensure but to double its efforts in securing the environment protection in the town. The mayor also thanked his good friend, former Quezon governor and MEDB co- chairman Eduardo Rodriguez for initiating the establishment of carbon dioxide membrane capturing technology facility and for his exceptional concern for the environment. It was also Rodriguez,l when he was the provincial governor of Quezon from 1988 to 1998, who initiated the construction of Quezon Power Ltd. and the Pagbilao Power Station in Pagbilao, Quezon to help the Ramos administration in saving the country from the lingering energy crisis that time. Rodriguez who was also present during the activity said the captured carbon dioxide from Quezon Power Ltd will be processed in the facility to another byproducts such as dry ice, welding, chemical products and fertilizers , among others which would eventually bring economic development in the town and livelihood in its residents. In his message, Rodriguez said this will bring domino effect that will further boost the economic side of the progressive town. “With this, factories for different products produced out of CO2 are expected to mushroom in this town. The remaining jobless residents in the villages can now be employed by these factories”, said Rodriguez. Once the facility is already established and fully operational, Rodriguez said their next target is the Pagbilao Power Station. 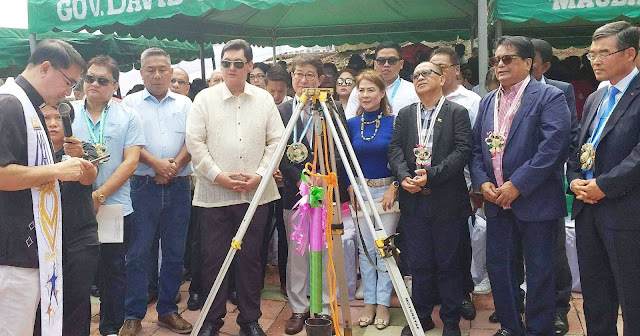 Energy Undersecretary Benito Ranque who graced the activity expressed all the way support to the project saying he is very grateful that Rodriguez and Llamas took the initiative on prioritizing the welfare and protection of the environment while advancing to progress. Ranque said it is mandated by the constitution and existing laws to protect and advance the right of the people to a balance and healthful ecology in accord with rhythm and harmony of nature and to pursue a policy of balancing development and environment protection. “This is a historical event for you are a prioneer in this type of pollution reduction technology to be applied in the country”. said Ranque.